AKIPRESS.COM - Mongolia will hold a traditional Spring Golden Eagle Festival on March 3-4 near capital Ulaanbaatar, a senior Mongolian official said Monday. "The festival aims to promote the ethnic Kazakh tradition of hunting with eagles internationally and boost the country's tourism," Tsend Enkhtuvshin, deputy head of Ulaanbaatar's tourism department, told Xinhua. More than 20 eagle hunters are expected to compete in the 12th edition of the festival to catch small animals, such as foxes and hares, with specially trained golden eagles, showing off the skills of both the birds and their trainers. "The festival is one of the most popular tourism activities in our country. The number of domestic and foreign tourists who visit the festival has been rising year after year," Enkhtuvshin said, expressing his hope for more tourists in this year's festival. Last year's Spring Golden Eagle Festival attracted around 4,000 domestic and foreign tourists, he said. Mongolia is home to the thousand year-old tradition of hunting with trained Golden Eagles. This unique tradition has been passed from generation to generation among the Kazakh nomads. 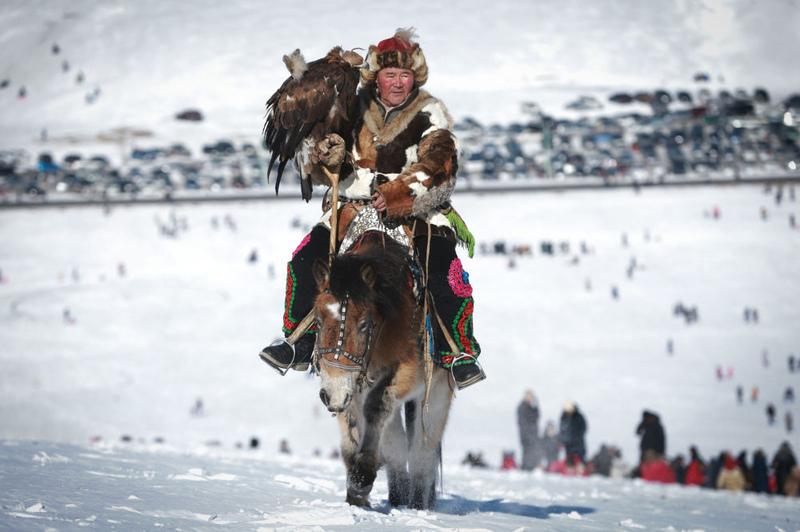 The Golden Eagle Festival is held twice a year in the spring and autumn season in Mongolia. The autumn festival is held in western Bayan-Ulgii Province.